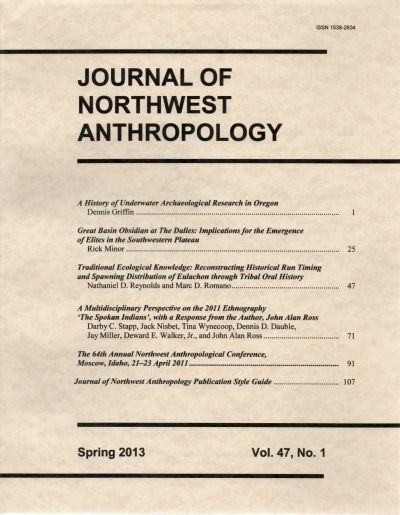 The Journal of Northwest Anthropology (JONA) is a well-regarded publication that serves as a resource for those interested in the anthropology of the Pacific Northwest of North America — specifically, the cultures and histories of the Native American peoples who lived throughout the region, including the Spokan. Professional archaeologists Darby C. Stapp and Julia G. Longenecker edit and publish the journal. In the Spring 2013 issue (Vol. 47, No. 1), on pages 71-90, readers will find a collection of articles, A Multidisciplinary Perspective on the 2011 Ethnography The Spokan Indians , with a Response from the Author, John Alan Ross . Introduced by Darby Stapp, it comprises five contributions from a variety of authors knowledgeable in the fields of anthropology and ethnobotany. The project was initiated and facilitated by Tina Wynecoop, a long-time friend of John Alan Ross, as well as a tireless supporter of the Spokan people, especially in helping to preserve the old ways. The articles are available here.